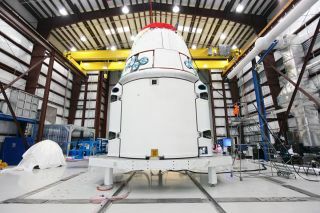 The Space Exploration Technologies, or SpaceX, Dragon spacecraft with solar array fairings attached, stands inside a processing hangar at Cape Canaveral Air Force Station, Fla. The spacecraft will launch on the upcoming SpaceX CRS-2 mission. Image released Jan. 15, 2013. A private rocket has flexed its muscles in a key pre-launch test, firing up in preparation for lofting the next commercial cargo mission toward the International Space Station this Friday (March 1). SpaceX's Falcon 9 rocket successfully executed a "static fire test" at around 1:30 p.m. EST (1830 GMT) today (Feb. 25), igniting its engines for a few seconds but staying earthbound at its launchpad at Florida's Cape Canaveral Air Force Station. "During the static fire test today, SpaceX engineers ran through all countdown processes as though it were launch day," company officials said in a statement. "All nine engines fired at full power for two seconds, while the Falcon 9 was held down to the pad. SpaceX will now conduct a thorough review of all data and continue preparations for Friday's targeted launch." California-based SpaceX holds a $1.6 billion deal with NASA to make 12 such resupply flights with Dragon and the Falcon 9. Dragon first reached the space station on a historic demonstration mission last May, and the company then flew its initial contracted cargo flight in October. NASA also inked a $1.9 billion deal with Virginia-based Orbital Sciences Corp. for eight cargo flights using the company's Antares rocket and unmanned Cygnus capsule. Orbital plans to fly a demonstration mission to the station later this year and successfully test fired the first stage if the Antares rocket last week, officials have said. The two contracts are part of a NASA effort to encourage American private spaceships to fill the cargo- and crew-carrying void left by the retirement of the space shuttle fleet in July 2011. The space agency hopes at least one commercial vehicle is able to carry astronauts to and from low-Earth orbit by 2017. Until one or more of these manned spaceships is operational, NASA will rely on Russian Soyuz spacecraft to fly its astronauts, at a cost of about $60 million per seat.